As a continuation in our series of Java Interview Questions, here we cover top 25 Java Interview Questions for Freshers that will help you start your career in Java. Java was developed as an open-source and platform-independent programming language by the Sun Microsystems in the year of 1995. From that, it has stayed relevant and showed no sign of decline in its popularity and for that reason, it is still one of the most popular programming languages. 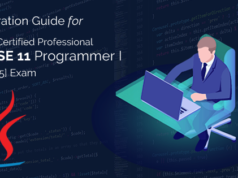 Most of the developer choose it up as their first programming language because its syntax is simple and reasonably easy to learn. Java could be learned in a very short span of time because it has English-like syntax with minimum use of special characters. It comes from a family language which is heavily influenced by C++, therefore, it provides vast opportunities when you go for these languages. Java has become an important part of software development through which different applications are delivered for banks, governments, schools, colleges, media companies, and tech-giants. Java’s current owner Oracle published a report which says that 97 percent of the enterprise desktops run Java. Enterprises adaption rate of Java is always been high and consistent which is also one of the reasons it is still relevant. If you are planning to learn Core Java or any interview is scheduled in coming days. As core java plays an important role in any Java interview, Java interview questions for freshers help you to prepare for Java-based interviews. In any Java-based interview, core Java is the favorite area for the most interviewer and always considered to be the deciding factor of the interview. In this article, we are trying to provide some of the important core java interview questions for freshers with answers which are to the point. These questions cover important core java concepts which will really help you in your preparation. Here are the top 25 Java interview questions for freshers. 1. What are the key differences between C++ and Java? 1) C++ is platform dependent. 1) Java is platform independent. 2) C++ writes structural programs without using classes and objects. 2) Java is a pure object-oriented language except for the primitive variables. 3) C++ doesn’t support documentation comment. 3) Java supports documentation comment (/**…*/) to create documentation for java code. 4) C++ fully supports pointers. 4) In Java, there is no concept of pointers. 5) C++ supports multiple inheritance. 5) Java doesn’t support multiple inheritance. 2. Explain the JVM architecture? Answer: Java Virtual Machine contains key components which are classloader, memory area, execution engine etc. It is a subsystem of JVM which load class files. Whenever a Java program is run, it is loaded by the classloader. Class Area holds class level data of each class file such as metadata, constant run pool, and static variables. It is the runtime data which is used for allocating objects. The stack is used for storing temporary variable. This component has a stack frame which is allocated one frame to each thread and when the execution of the thread is completed then that frame is also gets destroyed. This component contains the address of JVM instruction which currently being executed. All the native method stack used in the application are stored in this. An interpreter that executes the instructions after reading the bytecode. JIT compiler, used for improving the performance due to the slow execution. It compiles the similar part of the bytecode at the same time which reduces the total time needed for compilation. It provides an interface which is needed for communicating with another application developed in another language like C, C++, C# etc. 3. What is the use of Classloader in Java? Answer: A Java program is made up of a different number of custom classes and pre-defined classes. When a program is executed, JVM is used to load all the content of that needed class and through the use of Classloader JVM, it finds that class. It loads all the classes from the classpath. It loads all the classes from the extension directory. It loads all the pre-defined java classes. 4. Which class is a superclass of all classes? Answer: Java.lang.The object is the root class for all the java classes and we don’t need to extend it. Every other java classes fall back under the object. All the different non-primitive types including arrays are inherited directly or indirectly from this class. 5. What is the static keyword? Answer: The static keyword is used with a class level variable to make it global so all the objects will be able to share the same variable. It can also be used with methods. A static method can access only static variables of the class and invoke only a static method of the class. The interview generally asks this question in the Java interview questions for freshers. Even if you are a fresher, you should have a good knowledge of the keywords in Java. 6. What are finally and finalize in Java? Answer: Finally block is used with a try-catch block to put the code that you always want to get executed even the execution is thrown by the try-catch block. Finally is just used for releasing the resources which were created by the try block. Finalize() is a special method in Object class that we can override in our classes. Finalize() is called by the Garbage collector to collect the garbage value when the object is getting it. This method is generally overridden to release the system resources when garbage value is collected from the object. 7. What is Type casting in Java? Answer: When we assign a value of one data type to the different data type then these two data types might not be compatible with each other and needs conversion. If data types are compatible with each other like, in case of the conversion of int value to long then automatic conversion is done by the Java and doesn’t require typecasting. But if data types are not compatible with each other then they need to be cast for conversion. 8. What is the inner and anonymous inner class? Answer: In Java, we can define a class inside a class and they are called nested classes. Any nested class which is non-static are known as inner class. Inner classes are associated with objects of the class and they can access all the variables and methods of the outer class. Any local inner class without any name is known as an anonymous inner class. It is defined and instantiated in a single statement. Anonymous inner class always extend a class or implement an interface. Since an anonymous inner class doesn’t have any name, it is not possible to create its constructor. 9. What is break and continue statement? Answer: In a while or do-while loop, we use break for a statement to terminate the loop. We use a break statement in a switch statement to exit the switch case. We can also use break statement for terminating the nested loop. The continue statement is used for skipping the current iteration of a for, while or do-while loop. We can use the break statement with a label to skip the current iteration of the outermost loop. The most basic programming question, not only related to the Java. 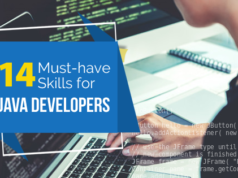 If you have some knowledge of programming languages, you should know the answer to this question as it is among frequently asked Java interview questions for freshers. 10. What is an interface? Answer: Interfaces are the core part of Java programming language used a lot in JDK, java design patterns, and most of the frameworks and tools. The interface provides a way to achieve abstraction in Java and used to define the contract for the subclasses to implement. The interface is a good starting point to define the type and create a top-level hierarchy in your code. In Java, a class can implement multiple interfaces, it’s better to use interfaces as a superclass in most of the cases. 11. What is aggregation in Java? Answer: Aggregation is best defined as the entity reference where it represents the relationship between two classes where the aggregate class contains a reference to the class which it owns. Aggregation represents a has-a and whole/part relationship. For example consider an aggregate class Employee stores information such as name, age, salary, and the Address class stores information such as city, state, and pin-code. Now, if the Employee class is defined to contain an Address object then it will be said that the Employee object has-a Address object. The Address object also makes up part-of Employee object – there is no employee without any address to live. Therefore, the Employee object owns the Address object. 12. What is the use of System class in Java? Answer: This question is among the most common Java interview questions for freshers. Java System class is one of the core classes. One of the easiest ways to log information for debugging is System.out.print() method. System class is final so we can’t subclass and override its behavior through inheritance. System class doesn’t provide any public constructors, so we can’t instantiate this class and that’s why all of its methods are static. Some of the utility methods of System class are for array copy, get the current time, and reading environment variables. 13. What is an instanceof keyword? 14. What is an Iterator? Answer: Iterator interface provides methods to iterate over any collection. We can get iterator instance from a collection using iterator() method. Iterator takes the place of Enumeration in the Java Collection Framework. The iterator allows the caller to remove elements from the underlying collection during the iteration. Java Collection iterator provides a generic way for transversal elements of a collection and implements Iterator Design Pattern. 15. What is the Java Collections Framework? Answer: Collections are used in every programming language and when initial java was released it contained few classes for collections: Vector, Stack, Array, and Hashtable. But for larger scope and usage, Java 1.2 came up with Collection Framework that grouped all the collections interfaces, implementations, and algorithms. Java Collection has come through a long way with usage of Generic and concurrent Collection classes for thread-safe operations. It has included blocking interfaces and their implementations in Java concurrent package. In this section, we will cover the most popular Java interview questions for freshers which are commonly asked in all Java interviews. 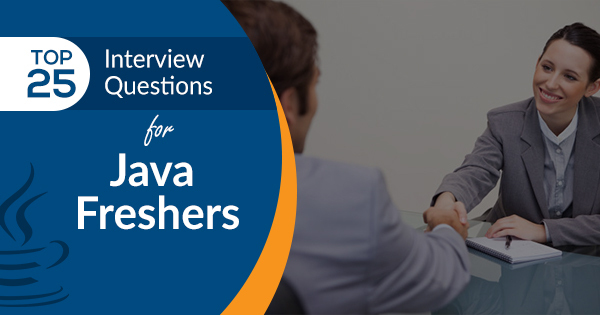 These popular Java interview questions for freshers will definitely help you in your preparation and will provide you with a better concept. 16. What do you understand about Thread Priority? Answer: Every thread when gets born is assigned with a priority value and usually higher priority gets precedence in execution but it also depends on the Thread Scheduler implementation which is OS dependent. We can assign the priority of thread but it doesn’t guarantee that higher priority will get executed before lower priority thread. Thread priority is an integer value varies from 1 to 10 where 1 is the lowest and 10 is the highest priority thread. 17. What is Thread Scheduler and Time Slicing? Answer: Thread Scheduler is Operating System service which allocates the CPU time to the available runnable threads. Once a thread is created and it’s in the runnable phase then it’s execution depends on the implementation of the Thread Scheduler. Time Slicing is a process of dividing available CPU time among the various runnable threads. Allocation of CPU time will depend on the thread priority or for how much time it is in the waiting state for getting the CPU time. Thread Scheduling cannot be controlled by Java, so it’s always better to control it by the application itself. 18. Which is more preferred – Synchronized method or Synchronized block? Answer: The synchronized block is more preferred because it doesn’t lock the object, synchronized methods lock the object and if there are multiple synchronization blocks in the class, even though they are not related, it will stop the execution and put them in a wait state to get the lock on the object. 19. How to create daemon thread in Java? Answer: Thread class setDaemon(true) is used for creating daemon thread in Java. We used to call this method before calling the start() method else it will give IllegalThreadStateException. Answer: ThreadLocal in Java is used for creating thread-local variables. We know that all threads of an object share its variables. So, if the variable is not threaded safe then we can use synchronization. But if we want to avoid synchronization then we can use ThreadLocal variables. Every thread has its own ThreadLocal variable and they can use get() and set() methods to get the default value or change its local thread value. ThreadLocal instances are typically private static fields in classes that wish to associate the state with a thread. 21. Explain the Java Exception Hierarchy. Answer: Java Exceptions are hierarchical and inheritance is used for categorizing the different types of exceptions. Throwable is the parent class of Java Exceptions Hierarchy and it has two child objects – Error and Exceptions. Errors are exceptional scenarios which are out of the scope of applications and it’s not possible to anticipate and recover from them, for example, hardware failure, JVM crash or out of memory error. Exceptions are further divided into checked and runtime exception. Checked exceptions are exceptional scenarios that we can anticipate in a program and try to recover from it, for example, FileNotFoundException. We should catch this exception and provide a useful message to the user and log it properly for debugging purpose. The exception is the parent class of all the Checked exceptions. Runtime exceptions are caused by bad programming, for example, trying to retrieve an element from the Array. At first, we should check the length of the array before trying to retrieve the element otherwise it might throw ArrayIndexOutOfBoundException at runtime. RuntimeException is the parent class of all runtime exceptions. This is one of the most common Java interview questions for freshers. So, don’t miss and clear your concepts on Java exceptions. 22. What happens when an exception is thrown by the main method? Answer: When an exception is thrown by the main() method, Java Runtime terminates the program and print the exception message and stack trace in system console. 23. How do you ensure that N thread can access N resources without getting into the Deadlock situation? Answer: In the case when N thread can access N resources without getting into a deadlock situation, here the key point in order. If we acquire resources in particular order and releases resources in reverse order then we can prevent the deadlock situation. 24. How to get the database server details in Java program? Answer: For this, we can use DatabaseMetaData object to get the database server details. When the database connection is created successfully, we can get the metadata object by calling getMetaData() method. There are also many methods in DatabaseMetaData that we can use to know the product name, it’s version and configuration details. 25. What is JDBC PreparedStatement? Answer: JDBC PreparedStatement object represents a precompiled SQL statement. We can use its setter method to set the variables for the query. Since PreparedStatement is precompiled, it can then be used to efficiently execute this statement multiple times. PreparedStatement is a better choice than Statement because it automatically escapes the special characters and avoids SQL injection attacks. 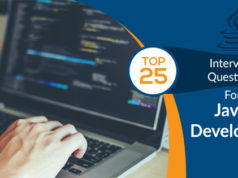 So, here we have covered the top 25 fresher Java interview questions. You can also find different questions from the other sources. The key to getting success in the Java interview is going through as many questions as you can. The more questions you will go through, it will only increase your chance of clearing the interview. Being certified also gives you an advantage to ace the interview. So, if you haven’t validated your Java expertise yet, we’ll recommend you start your preparation now for the Java certifications. Choose your certification and start the preparation with Whizlabs Oracle Java Certifications training courses. Best of Luck for your interview!